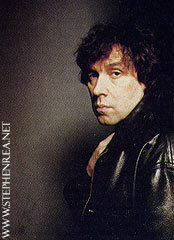 In a tiny, overheated dressing room on the third floor of Manhattan's Booth Theater, Stephen Rea crumples in his chair and sits chin to knees, clutching his gut. "Holy Mother of God," he bellows - something the soft-spoken Rea rarely does - " my stomach just turned over." One of Ireland's best - known stage and screen actors, the lanky, shaggy-haired Rea has just had a sudden and unexpected surge of Opening-in-America jitters. His 40-ish face, lined with an optimist's innocence, stares at a blank wall, considering the inevitability of...reviews. His brows draw together in a deep furrow. Rea may be in for a lot of critical inquiry, but with the Broadway premiere last month of Frank McGuinness' play Someone Who'll Watch Over Me (a dark comedy about three hostages in Beirut), as well as the release of Neil Jordan's much lauded The Crying Game (in which Rea plays a conflicted member of the IRA), he probably won't be departing the American scene any time soon. His lyric turn as The Crying Game's Fergus, the reluctant terrorist/lover, leaves audiences feeling proprietary, wondering what will become of their hapless guide whose descent into London's demimonde forms the movie's emotional core. "He's an innocent because ideology has closed him off to a lot of things," Rea explains, as if speaking about a close but fragile friend. "And then suddenly, when somebody becomes available to him, the floodgates open. He's on a sort of a quest for redemption, but he ends up sullied, doesn't he?" While his perforrnance propels the movie, Rea says it's Jordan who is responsible for Crying's tenuous and surreal tone. "I'm arrogant enough to think I've done a lot for the film, but it's completely Neil," says Rea. He's always had this amazing vision, and he's enormously equipped to give flesh to it." This particular vision, like many of Rea's chosen projects, achieves its momentum by way of a political conflict, and yet Rea is reluctant to be considered political. It's not too terrific for an actor to be identified with a particular issue," he says. "People start to think you can't do comedy." There's no getting around it, though, as Rea's personal life begs the question. He was born the son of a bus driver in Belfast, where he still lives with his wife, Dolours Price, and their sons, Danny, 3 1/2, and Oscar (after Wilde), 2 1/2. Before they were married, Price, once active in the movement for Irish independence, spent eight years in prison, convicted of a car bombing in the early '70s, though Rea says that neither of them is politically active now. This last subject, which Rea rarely discusses, gets broached by interviewers with great trepidation. "It's okay, it's okay, it's okay," he whispers to ward off further apologies. "I've been worked over by the English press because there's an assumption that my politics are identical with my wife's, and for that matter that my wife's politics are identical with her politics of 20 years ago." Rea stops to think just how much he wants to see in print. He proceeds. "I don't feel ashamed of my wife's political background, and I don't think she should either. I feel that the people who administered the North of Ireland for the last 20 years should be ashamed. There you are," he says, as if he has just served soup. "That's a political statement." Holy Mother of God, indeed.